Stay the course because there is no road the all-new V-Strom 1000 ABS Adventure was not made to conquer. This motorcycle makes the journey of life seamless. Conquer city traffic as easily you scale mountains. Roar down new highways. Explore your taste for discovery on roads long untraveled. Starting now, the planet is your neighborhood. The all-new 2014 V-Strom 1000 ABS Adventure was redesigned from the ground up. It has many improvements over the previous V-Strom 1000 and the list is enormous. One of the newest changes or additions is Suzuki’s first Traction Control System on a motorcycle which the V-Strom proudly carries. Other features that were improved or redesigned are the engine, fuel injectors, magento, idle speed control, radiator, clutch, transmission, exhaust, suspension, and much more! See the features list for more details on this one of a kind adventure bike! The Adventure Model comes standard with the following accessories: Skid Plate, Hand Guards, Touring Windscreen, Side Cases and Mounting Brackets, and Accessories Bars. Suzuki’s Traction Control System* continuously monitors the front and rear wheel speeds, the throttle position sensor, the crank position sensor, and the gear position sensor. It quickly reduces engine output when it detects wheel spin. It controls the engine output by managing the ignition timing and air delivery about every 4 milliseconds. 1 The rider can select three modes (1, 2, and off). Modes 1 and 2 differ in terms of sensitivity. Mode 1 has lower sensitivity; it allows a certain degree of rear wheel spin. Mode 2 has higher sensitivity; the system effects traction control sooner. *Note: The traction control system is not a substitute for the rider’s throttle control. It cannot prevent loss of traction due to excessive speed when the rider enters a turn and/or applies the brakes. Neither can it prevent the front wheel from losing grip. 2 A redesigned 1037cc, 90-degree V-twin engine is designed to get you where you want to go. Whether it is around town, on the open highway, or down the road less traveled. The light and compact Anti-Lock brake system (ABS)* system monitors the wheel speed as much as 50 times per wheel rotation and matches the stopping power to the available traction. A redesigned 1037cc, 90-degree V-twin engine is designed to get you where you want to go. Whether it is around town, on the open highway, or down the road less traveled. The new single-muffler layout provides a lower center of gravity which reduces weight and increases handling and maneuverability. The piston rings are thinner and have 15% less tensile force for lower friction. They contribute to higher combustion efficiency and fuel economy. New pistons were engineered with use of FEM analysis to achieve optimal rigidity and weight. Although the pistons are larger than the ones they replace, they are the same weight and equally rigid. The cylinder heads have been redesigned to accommodate two iridium spark plugs per cylinder. Twin iridium spark plugs for each cylinder heighten the spark strength and combustion efficiency, thereby contributing to higher power, more linear throttle response, easier engine start-up, and a more stable idle. Fuel injection by Suzuki’s original Suzuki Dual Throttle Valve (SDTV) system enables smooth power delivery and optimal combustion efficiency. A 32-bit engine control module provides state-of-the-art engine management and has optimized settings to suit the single muffler, resulting in better fuel economy and linear throttle response. The new fuel-injection system works with the Suzuki-developed and patent-pending throttle-body-integrated Idle Speed Control (ISC) system. The ICS contributes to easy cold-starting, stable idling, and lower emissions. A newly designed magneto has low-loss material that heightens power-generating efficiency for lower mechanical losses and accordingly higher output at low and medium-range engine speeds. The Suzuki Clutch Assist System (SCAS) works as a slipper clutch on downshifts. By letting the clutch slip at a certain degree, the rider has reduced fatigue and smoother shifts. The V-Strom has a 6 speed constant mesh transmission where the 6th gear has been redesigned for a smoother ride. 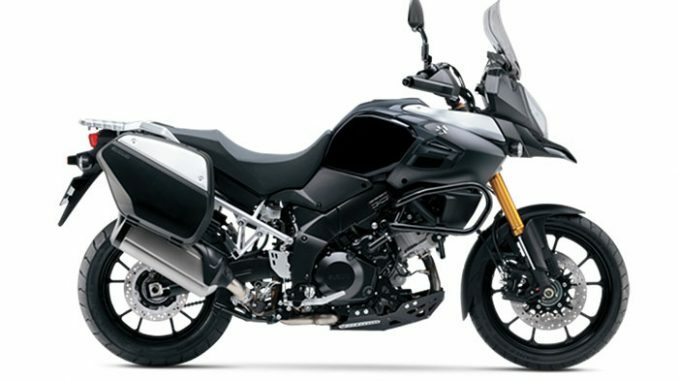 The V-Strom 1000’s chassis has been redesigned to perform well in all kinds of roads the rider typically encounters during on tours. 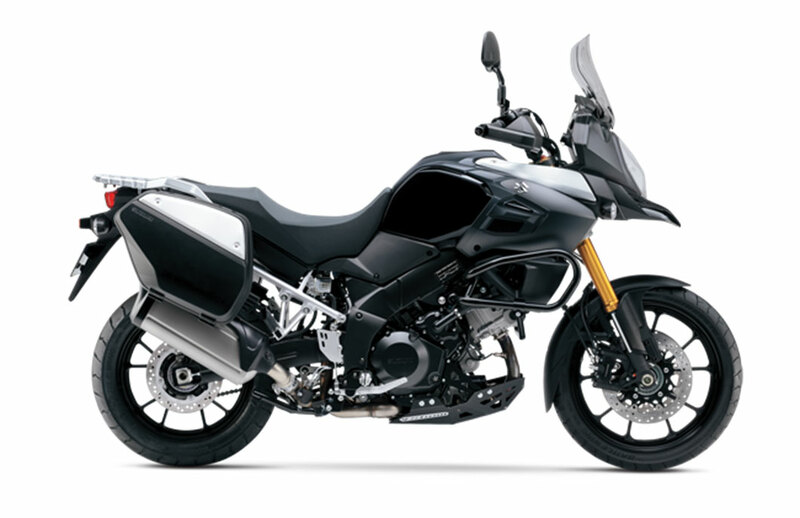 The new V-Strom uses a 43mm KYB inverted front forks to provide a sporty yet plush ride in diverse conditions. 3 Tokico 4-piston monoblock front brake calipers with 310mm floating-mount dual discs are now equipped with the new V-Strom for a stronger braking performance. The newly developed 9-way adjustable windscreen has been designed through extensive wind-tunnel testing. 4 The instruments include an analogue tachometer and a brightness-adjustable LCD speedometer. LCD readouts include an odometer, dual trip meters, the gear position, the coolant and ambient temperatures, the voltage, the riding range, the average fuel consumption, the instantaneous fuel consumption, the traction control mode, a fuel gauge, and a clock. The rear brake light has been changed to LEDs to offer higher visibility and greater durability than standard bulbs. The seat is shaped for comfort and the sidewalls have a high-grip texture. The seat height has also been lowered compared to previous years so riders can easily put their feet on the ground.